Governments and societies have to take the initiative to protect our soil, air and water. We, as individuals and communities, can start in tandem to make the greatest longterm impact at the local, grassroots level by changing our (over)consumption habits, including energy. Low-flow faucets and showerheads, etc. Now, with greater agreement and a broader consensus on the imminence of climate change and global warming we have an incentive to conserve even more efficiently at home: through solar electricity and rainwater harvesting and filtration. Even at the dojo we've converted from purchased bottled water to city tap water after becoming more aware of some serious drawbacks to water privatization not only in the U.S. but worldwide, especially in the poorer, developing countries. This site documents our major, most aggressive activities. Each section title is a link to an overview of what has been accomplished to date. The accompanying pictures, data sheets, links and analyses illustrate some aspects of the respective projects. The Contents column on the right lists links and pages with more detailed information or images. This documentation is essentially duplicated in a binder of the same data for browsing at our Mountain View dojo. As you browse this site or the binder we hope that you'll find some interesting ideas and possibilities suitable for yourselves. Not everyone can do all of the same things, but everyone can do something! If you or your family want to explore any or all of these conservation areas or topics, we'd be delighted to share the results of our experiments. We also welcome your feedback, and share your experiences. By now everyone knows that the sun daily delivers clean energy free of pollutants, and solar panels in a range of sizes and configurations have been installed throughout the world in sunny regions to generate electricity for cities, towns and households. The technology has become cost-effective and improved enough to have solar arrays ( an array is a group of solar panels ) of photovoltaic ( PV ) cells on roofs generate enough electricity to power a home. In our case, an array of twenty-one ( 21 ) panels, roughly 600 feet square, produces nearly our entire annual consumption of 10,000 kilowatt hours ( Kwh ), virtually turning us into a ( very ) small electrical utility and power company. Ultimately we expect to rely on public utility power for no more than 1,000 Kwh/year ( 1 Mwh/year ). As of Spring 2012 the house is all-electric. The house, and 1 1/2 vehicles, are free of non-renewable fossil fuels, and operate entirely on solar power, except for the 10 gallons of gasoline per month to run the hybrid Honda Insight. Energy generated beyond our needs is fed into the public electrical grid, triggering a corresponding reduction of our utility bills. The table provides a snapshot of the savings of tons of fossil fuel that would otherwise spew into the atmosphere, and also on our water and other heating bills. We've saved much water over the years with low-flow restrictors and aerators on all faucets, showers and baths, and by installing ultra-low flow ( ULF ) toilets. A new HET ( High-Efficiency Toilet ) toilet now uses merely 1.3 gallons per flush, compared with 1.9 gallons per flush for a ULF or 3 or more for a standard toilet. Turning water off when not in use is another way to use less water. Replacing grass with wood chips, and planting trees and shrubs, changes the landscape to a forest or woodsy look and feel. Replacing sprinklers with drip irrigation conserved even more water. Still, irrigation on average represents up to 40% of a typical home's water use. Harvesting rainwater ( RWH ), collected on the roof, captures water from the sky and returns it to the soil, replicating the natural water cycle ( Supposedly every drop of water on earth has existed since the earth was formed, and no new water was ever added: ocean water evaporates to the sky, rains on earth and returns to the sea through the ground! ). Our 3,500 square-foot roof captures approximately 30,000 gallons of water per year. 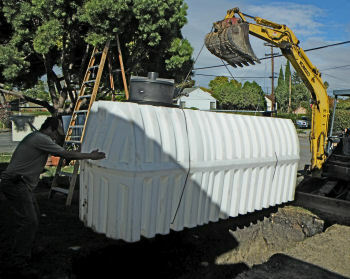 Six drainspouts pour the water into four ( 4 ) underground cisterns with a total capacity of 7,000 gallons. The harvested rainwater irrigates the yard. Further water treatment filtration in the house purifies the water to potable quality levels for clothes and dish washing, showers and toilet flushing inside the house, and to date has covered 100% of our annual water use. Testing Potable Water Quality: Before using domestic water in the house, it should be tested periodically for contaminants, to ensure family safety and health. Water testing and test laboratories are discussed in detail in the sections on Potable Water and Hot Water. Landscaping: Technology contributes less to reducing our carbon footprint than planting trees and shrubs, replacing grass lawns, composting and recycling. A wood chip "forest floor" not only looks attractive, but regenerates the soil and absorbs rain runoff. Honeybees forage in a 2-to-5 mile radius for nectar and pollen from drought-resistant, flowering plants and shrubs native to California, and pollinate fruit trees and vegetable gardens. Removing concrete "tarmac" and creating permeable spaces between stepping stones and driveway slabs also helps reduce runoff into storm drains. Simply removing the wood separators between the concrete slabs in driveways and terraces allows the rain to seep back into the soil, instead of contributing to city waste water and stressing storm drains. Trees and shrubs provide oxygen and absorb carbon dioxide, and the vegetation supplies a canopy for shade and cooling during the summer. Combatting Honeybee Colony Collapse: Healthy bee populations are critical for cross-pollinating 30% of our food supply. Ninety percent (90%) of the world's food supply comes from 100 crop species, and 71 of those species--Many of our vegetables, fruits, nuts, grains and cattle feed --depend on bees for pollination. Mysteriously, since around 2005 up to 30% of honeybee colonies worldwide have been dying or disappearing for only partly known reasons. Suspects include systemic pesticides, such as neonicotenoids; monoculture, besides the traditional threats of mites and viruses, etc. Hosting beehives is a small way to contribute to countering or even reversing Colony Collapse Disorder ( CCD ), but bees take a lot of work to support. Some enterprising small beekeepers nationwide, including the SF Bay Area, are now providing not only guest, say 1 to 6, beehives and their colonies, but also regular honey harvesting, "housekeeping" support and maintenance, in exchange for an annual fee, 80-90% of the bees' production, or other, individual, arrangement. Contact us if you want more information, or to explore hosting one or more bee colonies. An off-white PVC "membrane" replaced the original tar-and-gravel roof. The pale color reflects the sunlight, thereby helping to cool the interiors. R-22 fiberglass insulation between the roof and the cover further reduces heat exchange: cooling during the summer, retaining heat inside the home during the winter. 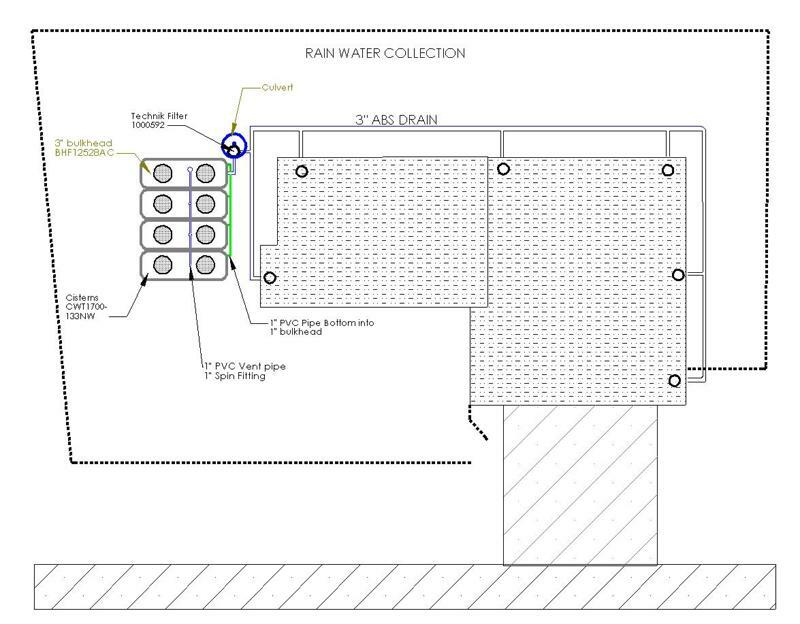 The PVC roof also complements rainwater harvesting by improving the flow of rainwater over the roof to the drainspouts. Although we haven't installed them, "Green" roofs, i.e. plants and planter boxes on the roof, are another way to conserve energy.